In light of the critical role that the 2020 Census will play in determining how billions of dollars of federal funding will be allocated, Lawyers for Civil Rights (LCR) today announced a multi-pronged effort to ensure that all Massachusetts residents are counted. The campaign will include a multilingual Census Hotline and extensive community education materials. Outreach about the Census is particularly critical in the current climate, since immigrants and people of color have been repeatedly targeted for civil rights violations through policies enacted by the federal government. There is widespread distrust of federal authorities, yet the 2020 Census will ask people to make themselves known to the federal government. 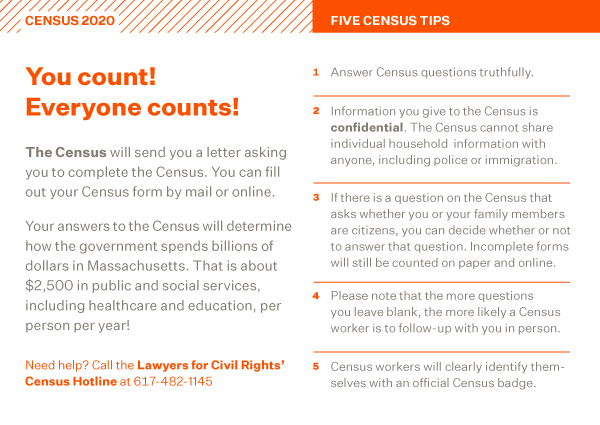 To overcome this distrust and educate our client communities about the importance of Census 2020, Lawyers for Civil Rights is launching a multilingual Census Hotline to disseminate legally accurate information, and communicate directly with affected individuals who have questions and concerns about the Census. We will also create and disseminate educational outreach materials – including toolkits, palm cards, and community presentations – to empower hard-to-count populations and encourage their active Census participation. We will also provide free legal advice and counsel to individuals, families, and community groups who encounter any issues regarding Census participation. This rapid-response and on-the-ground campaign will complement our broad-based Census advocacy efforts. Last month, we sent the Director of the Regional Census Office a demand letter outlining problems that are arising already as Census 2020 is being planned. And we continue to advocate against the inclusion of any proposed citizenship question, which would have a chilling effect on participation among immigrants – leading to a significant undercount. A federal district court judge has ruled that this question may not be included on the 2020 Census, but the Trump Administration has appealed that ruling to the U.S. Supreme Court. Given the critical importance of the Census and the changing legal landscape, it is imperative that immigrant communities and communities of color have accurate, timely information about the Census. The public education and legal assistance campaign that we are launching today will further that goal. Call the Census Hotline at (617) 482-1145 or email census@lawyersforcivilrights.org.